Woohoo, it’s almost summer time, which means….. Kids Camp time! Our 4th annual American Classic Kids Camp will be held June 25th-29th from 9am-12pm! Ages 6-16 are welcome! 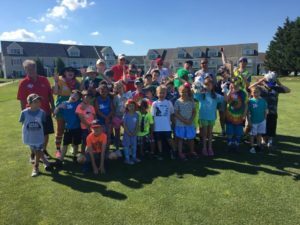 This year we will be teaching all aspects of golf, as well as, having awesome activities like baseball golf, a drive, chip and putt contest, and maybe even a fun obstacle course!